Willing to explore more than one ski-area in the world’s snowiest place Hokkaido? Then Freeride Road Trip is the choice. 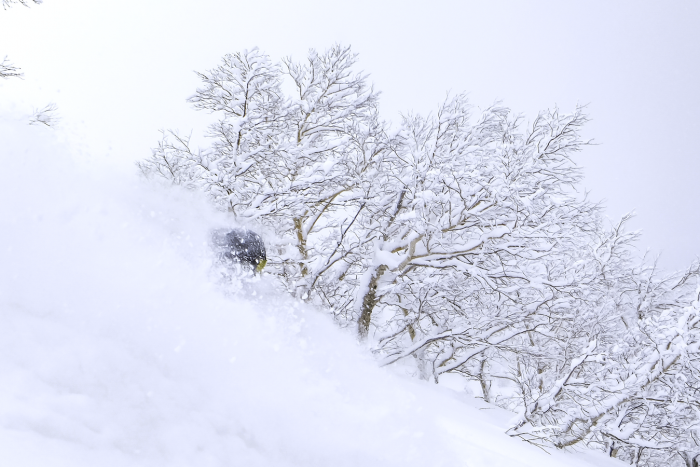 This tour is designed to take you to Central-Hokkaido’s most famous powder paradises. Hokkaido Road Trip is a perfect option also for solo travelers – You will get to know other like-minded adventurers. Imagine tons of fluffy powder snow, able to ski and snowboard as much as your legs and daylight allow, exploring authentic Japanese culture with other like-minded fellow travelers in small group. This is what our best-selling tour Hokkaido Road Trip is all about. We have received great feedback from our returning clients how our trips are more like traveling with friends. Safety, small groups and flexibility are the corner stones that so many clients and their friends return year after year. Trip starts from Central-Hokkaido and ends to Niseko area. In between we’ll show you phenomenal skiing in several resorts and backcountry spots. You’ll get to ride variety of different kind of terrain and see authentic Japanese culture at its best and lots of adventure. Central Hokkaido is known for its never-ending amounts of powder snow and slightly bigger mountain range than in Niseko area. During the trip, we’ll guide both in a ski-resort area and its off-piste and full backcountry spots. Backcountry days will be spent away from any resort and hikes take usually 45-90min depending on the terrain. Some of these spots are located nearby old traditional Onsen-hotspring Ryokans’ and we get to enjoy the ultimate relaxation of hot water and cold beer after intensive day at the BC. During Hokkaido Road Trip you’ll ride daily together with our professional backcountry guides. Participants will be divided into two smaller groups based on the previous experience and ability level. Small groups ensure that you’ll get the maximum out of your ski-day, instead of having extra waiting for other group members. Snowboard and ski together with our dedicated mountain professionals that will show you Central Hokkaido’s hidden gems. At the beginning of the trip we will have snow safety training for all guests. Our snow safety expert will go through safety related topics that are essential for all freeriders. In addition, we will explain and train how to use snow safety equipment and do companion research and rescue. Safety is our number one priority and we do our best to minimize the risks associated with off-piste and backcountry skiing by working with top guides and the best safety gear available. Our guides are constantly practicing snow and avalanche management as they analyze the changes in the conditions and make guiding decisions accordingly. In order to minimize risks Paromcamps requires that every guest carries snow safety gear (transceiver, probe, shovel) in the backpack while riding off-piste and backcountry. In a case the guest doesn’t own his/her own gear, we are happy to rent out the set for them. You can choose our camps with or without flight connection. Our crew will pick you up from the New Chitose airport and transport directly to the first location in Central Hokkaido. Our trip starts from Asahikawa area, moving to Otaru direction and finally to Niseko. During Hokkaido Road Trip accommodation is provided in local hotels and guest houses in twin rooms. Please inquire our rate if you wish to stay in a single room. Trip includes daily breakfast that is often traditional Japanese style catering. Last days of the trip will be spent in Niseko area. Paromcamps Freeride Lodge’s location is unique – up in the mountains and hills of Chisenupuri, just stone throw away from Niseko ski area is truly a getaway from the fuss. During the trip we’ll be accommodating in Asahikawa City and Chisenupuri. Accommodation is planned so that you don’t have to change location every single day, whereas we tend to stay in each town few nights. Changing location and transfers doesn’t affect the number of ski-days. We will be riding every single day and travelling happens in the early evenings and takes usually 1-3 hours.